It always a great feeling when you film is working and people are liking it, morning when I sat down to read the news paper and read this article about Kalbhairav entering the forth week, I felt nice, as Mumbai is such a place which good films also run for two to three weeks , and if the film is entering the forth week then people are liking it and it is doing well. 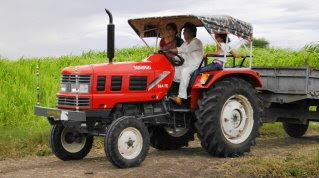 Mumbai is not the market for these kind of films, film like Kalbhairav do good business in the interiors of Maharashtra in the rural area, city audience prefer other kind of cinema. So two of my spiritual films are doing well in Maharashtra, as " Mahima Khandobacha" is also doing well in Pune ( three theatres Prabhat, Gunjan and Jayshree ) , even in Kolhapur and Ichalkarangi and other cities which I am not aware of. and now " Sasar Maze Mandir " releasing in 9 threatres on the 12th of sept. and premiere in Yawatmal. and " Arra Arra abba " releasing of the 19th Sept in Mumbai. So this festival season is really festive regarding my film releasing is concern. I wish success to all of them. Super Hit film " Mahima Khandobacha "
Yes my film " Mahima Khandobacha " is a hit, released on the 15th August '08 at Prabhat talkies Poona, and the response from the audience was overwhelming, and I could see a my film becoming a hit, this film from the very beginning that is from the script level as very good, when Pratap Gangavne the film writer narrated the story I loved it instantly, and I knew the Director Manohar Sarvankar was good as I had done a telefilm many years ago and that too was good, and was looking forward to work we him. 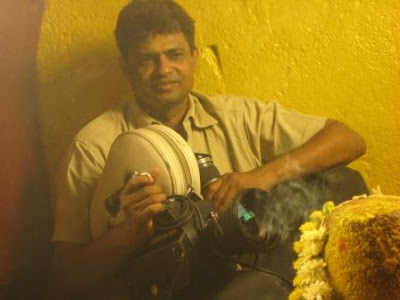 Sameer Atle did the camera and he is as usual good, I have done lot of work with him including " Maratha Battalion " , "Devki " etc. Milind Save did the graphics and that too are the highlights of the film. Working with Deepali is a pleasure, one of the best co-star anyone could ask for, very co-operative and so the scenes have come out to be the best. 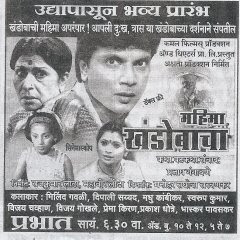 Comedy in the film by Vijay Chavan will make you roll and make your stomach ache laughing, Vijaymama at its best. Sameer did is best in this film , he travelled with us to shoot 12 khandoba's barefoot, he, manohar sarvankar and pavaskar travelled 4000 kms barefoot. fights in this film is also very good fight master Ravi Shinde did a great job. really it was worth all the pain.
" Yelkot Yelkot Jai Malhar "
Yesterday Kartik had invited me for his show, and I was looking forward for it, not only for Kartik was is a nice well mannered kid and grandson of Subalda ( legend choreographer of Marathi cinema ) who also dances well, and has choreagraphed my TareTaraka dance which I performed in poona with Samira Gujar and got appreciated. 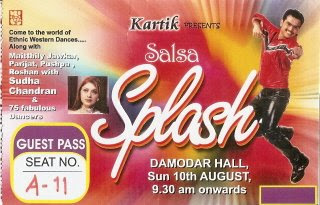 The other important reason I want to be present for the show was The Great Sudha Chandran. beyond words, She is one person I admire from bottom of my heart, and why not she deserves to be praised, loved and also saluted. Yesterday Kartik said that he had a chapter about her in the first standard school book, yes Sudha Chandran should be taught to all the kids. Sudha Chandran is in true sense and great human being, she had overcome the difficulties of life so gracefully that no one would believe certain things are possible in life, she truly inspires me. Very few must be knowing that Sudha has a Jaipur foot, and inspite of having only one foot and other artificial one, she dance like mad, very few having two proper feet can match her or even come close to her when she is on stage performing. Hats of to her, you have to see her to believe it. 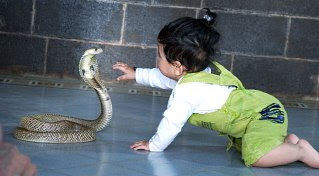 Every film in which I work has it own memories and it stay with me for years but this particular scene in which the child comes close to a cobra is something I will never forget, I was never scared of snakes and I have done many films in which snake was a part, but this time I couldn't stand the site, while shooting the child thought the snake was a toy, both his parents were on the set, and I asked them how do you allow your child to do such a scene, and to my surprise they said they were snake lovers and catch snakes in their village, it was not dangerous at all, but for me the site was unbelievable. Yesterday this film released at Bharatmata in mumbai in only one show, without much publicity, I with my parents and wife had gone for the premiere of this film, had invited few friends, Santosh Pathare, Subal Sakar, Savne made it a point to come. 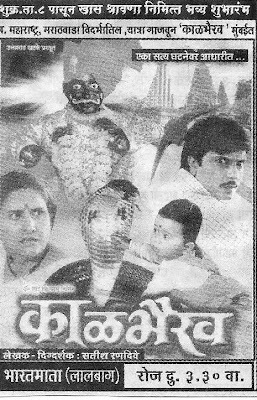 This particular bhajan in the film sang by Abhijit Kosambi is very good, this film has its plus points as well as it drawbacks, the snake sequences and very thrilling and exciting especially with the child, one has to see it to believe it..
Its true that the more you work with snakes, you fall in love with the animal, there are many mis concepts about this animal, and this film is all about that, the moral of this film is " MAN IS MORE POISONOUS THAN ANY SNAKE "